So, how do you take what has been captured in that SWOT analysis and put it to good use? How do you create action steps based on the SWOT that will move the needle in your marketplace? 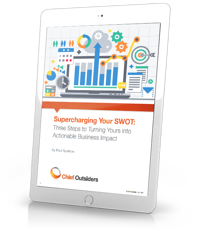 It’s time to supercharge that SWOT by actually leveraging your strengths and minimizing weaknesses in a way that captures those opportunities, while warding off threats. Fortunately, there’s a logical way to take those first bold steps to unlock the power of the SWOT. It’s a three-stage process during which we CONSOLIDATE the information we’ve gathered into a digestible format; ACTIVATE the consolidated data; and EXECUTE for success. If you are successful in implementing what we learn in these three stages, the results can have a substantial impact on your business – refocusing your organization on the fundamentals most meaningful to your core audience today, and ensuring you are poised for sales success in a marketplace that only grows more competitive by the second.